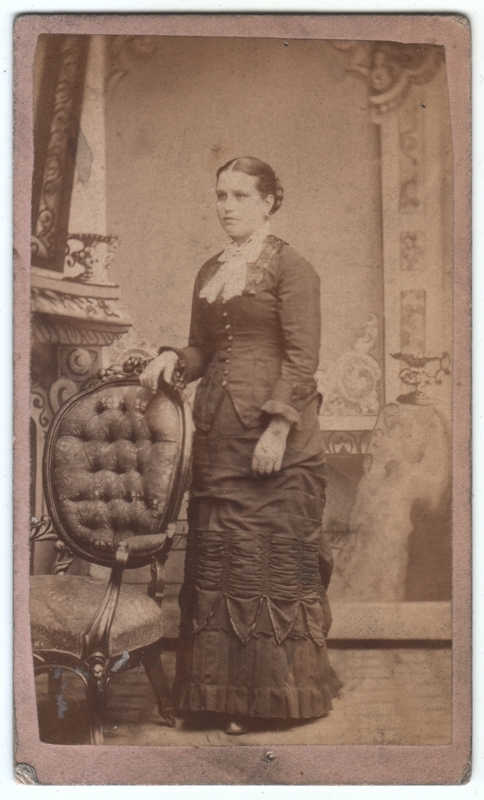 Photographer is L. N. Schmidt of Chicago, Illinois (“Card Photographs only $1.00 per dozen”). Otherwise undated and unidentified. I wasn’t sure what to call this one since I already have posts of women from Chicago. What makes this one different that would lend itself to a different title? It seems to me that, despite the elaborateness of her dress, with its corseting and apparent bustle in the back, the angle at which she is turned and the positions of her arms result in a silhouette that looks tubelike, which I’m guessing isn’t the intended effect. Not that she isn’t lovely anyway. She looks so miserable…really trussed up or recently engaged. Either way, she’s in pain. There’s a very vivid scene in E. L. Doctorow’s book “Ragtime” in which a man secretly watches a woman being undressed. (I can’t remember if it’s in the movie.) She had been all trussed up and corseted, and the binding clothing has left nasty marks all over her body, the sight of which both alarms and fascinates him. The woman, meanwhile, had simply taken the pain for granted because that’s what was expected of her. Reading it in my teen years, that scene was mind-boggling for so many reasons.